Authorities said a briefcase with wires hanging out of it was "rendered safe" by the San Diego police bomb squad and turned out to be a hoax bomb. "It's apparently something that somebody made to look like a bomb," said San Diego fire spokesman Maurice Luque. 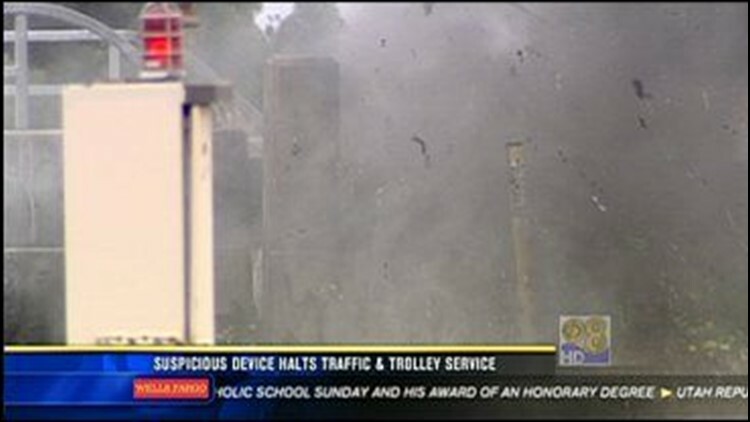 Traffic on Interstate 5 and the San Diego Trolley's Green Line, was stopped for varying times as the briefcase was blown apart. A passerby found the black, hardcover briefcase in the bridgework under Pacific Highway's overpass over Friars Road and the San Diego River around 9:30 a.m. Saturday, Luque said. The structure is nearly 80 years old and formerly carried US 101 between Old Town and points north. The briefcase had a lock, wires hanging out of it and a battery visibly attached, said San Diego police Sgt. Ray Battrick. Officials shut down Friars Road between SeaWorld Drive and Napa Street below the bridge, and also closed Pacific Highway between SeaWorld Drive and Rosecrans Boulevard. Nearby northbound Interstate 5 was also briefly closed while the bomb squad examined the suspicious-looking briefcase safe, Battrick said. The briefcase was "rendered safe" with the aid of a robot, Luque said, but declined to provide more details. All of the roads, except for Pacific Highway itself, were reopened after the briefcase was removed from the area, he said. San Diego Trolleys resumed service after a brief halt on the nearby Green Line, between the Old Town and Fashion Valley stops. The adjacent Linda Vista/Morena stop was evacuated during the incident, said San Diego police Sgt. Joe Benavides said. A shopping center and apartment complex right next to the trolley stop were not evacuated, according to an employee at Urbane Cafe, which is in that complex.